Picture taken during the Battle of Verdun, one of the most deadliest battles of the Great War. The concentration of so much fighting in such a small area devastated the land, resulting in miserable conditions for troops on both sides. The shells turned up the earth and left gigantic craters that would then fill with water in the unbelievably heavy rains. 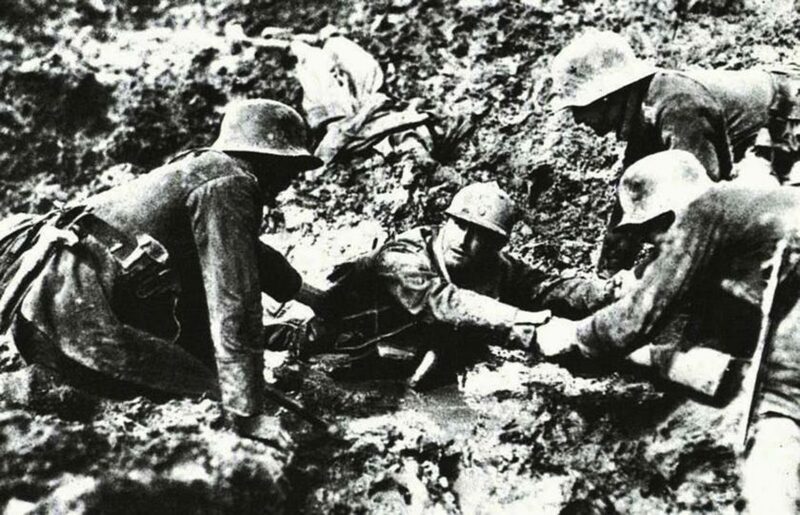 Many parts of the western front essentially became mud holes, where you could often have 6-10 ft (2-3 m) of thick mud before hitting dry earth. Falling in some of these places would be equatable to slower, thicker, stickier quicksand. Once soldiers were trapped in it often it was impossible to extract them. Soldiers would beg their friends to shoot them and spare them the agony of slowly drowning in the mud. At a basic level, Verdun was intended to bleed France’s armies. Falkenhayn, the commanding German officer, hoped to capture a number of French positions, forcing the French to counter attack to retake them, leaving them open to bombardment from German artillery positions. Falkenhayn hoped to recreate the devastation wrought on the French forces that the German artillery had inflicted during a series of battles in the Champagne region the year before. The offensive began in February, 1916 and by May, more than 200,000 German and French soldiers had become casualties. This casualty rate was particularly troubling for the Germans. While the French rotated their units out of the lines and replaced them with fresh ones, the German units were kept in the line and suffered continuously. The continued back and forth continued until December of 1916 when hostilities in the sector finally subsided thanks in part to the Battle of the Somme which required Germany to divert forces to repelling the British offensive. Even by the First World War standards, the horror that the men faced at Verdun was extreme. Flamethrowers were used for the first time as was phosgene gas, the artillery barrages were continuous and absolutely massive and the casualty rates are among the worst suffered. It also became a symbol of French resistance. The French armies had largely been humiliated and on the backfoot until Verdun and their victories there, no matter how small or costly, symbolized their devotion to resisting German aggression. Verdun did do enormous damage to the French forces. It saw the real beginnings of discontent in the French armies which would eventually lead to outright mutiny in some areas. Photo authenticity disputed: According to some sources the above picture may come from a film by Léon Poirier dating from 1928 named Verdun: Visions of History. The movie portrays the battle of Verdun, primarily by recreating the battle on its location, but also with the use of newsreel footage and dramatic scenes. Most of the people in the film are actual French and German World War I veterans. However, it’s impossible to prove whether the above image is staged. Even today the Verdun battlefield is a vast graveyard, where the mortal remains of over 100,000 missing soldiers remain where they fell, unless discovered by the French Forestry Service and laid in the Douaumont Ossuary.